SPEECHLESS!! 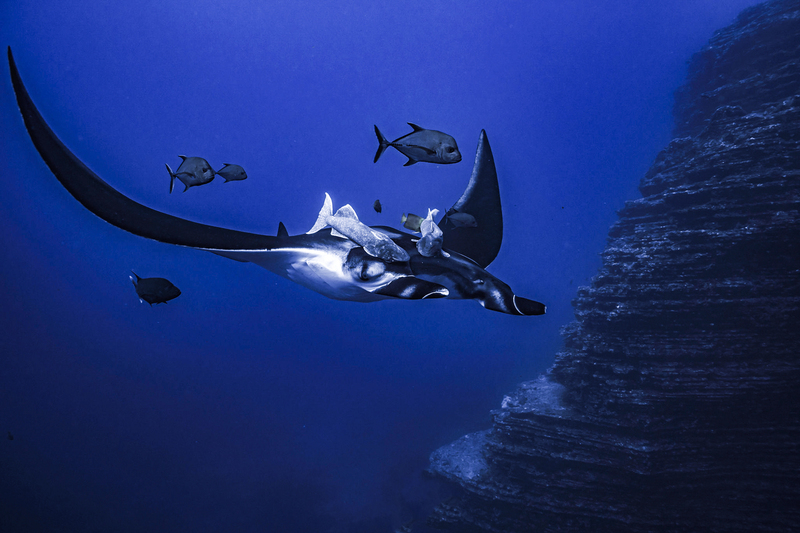 This was by far the best dive of my life – everywhere you looked there were mantas and dolphins, AND they kept coming back to us for the entire dive. What an incredible experience to be with these majestic animals – PURE JOY!! No words can ever describe or give credit to this dive!! Smiling, cheering divers coming up ONLY because we had to. My mask was filled with the sight of dolphins and mantas happily interacting with divers for the entire dive. Today I am grateful to be alive and to experience this particular moment on our great planet. Best dive ever! 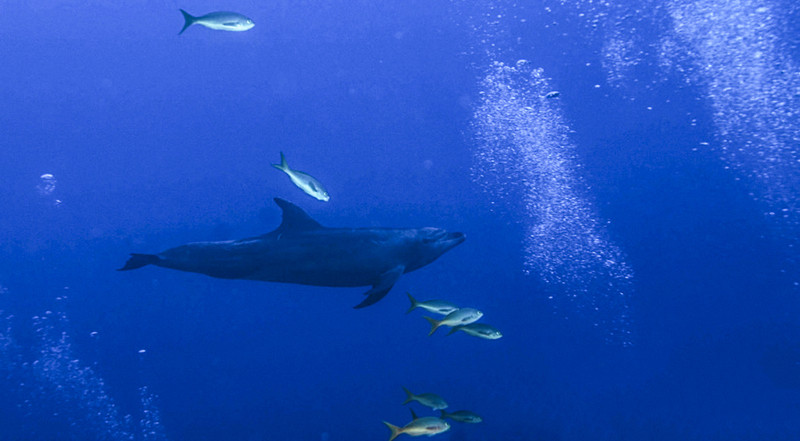 First dive in the morning, 5m under the surface: dolphins! 1, 2, 5, 7… then mantas came, lots of mantas. Just looking at them, the dolphins came back, playing with us. Oh, I’m quite long time at 31m, I’ve got to go up but I don’t want to! My eyes go to the surface. Wow, no problem going up: All the dolphins and Mantas were waiting for me…. I’m happy!! 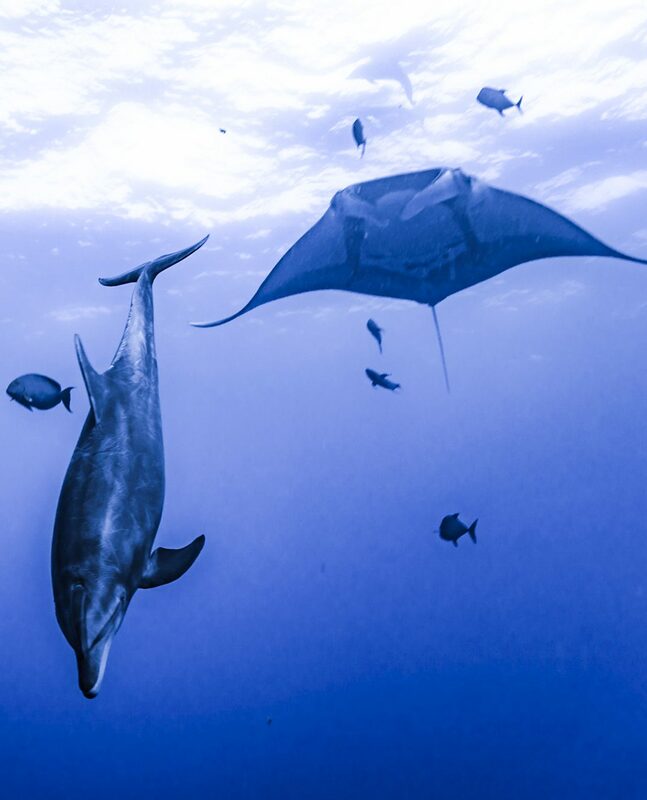 I never expected a dive like this – from entering the water until sadly leaving with empty tanks, all the divers interacted with so many mantas and dolphins. We didn’t know where to look as we were surrounded throughout the dive. It was such an incredible experience, and still can’t stop smiling. 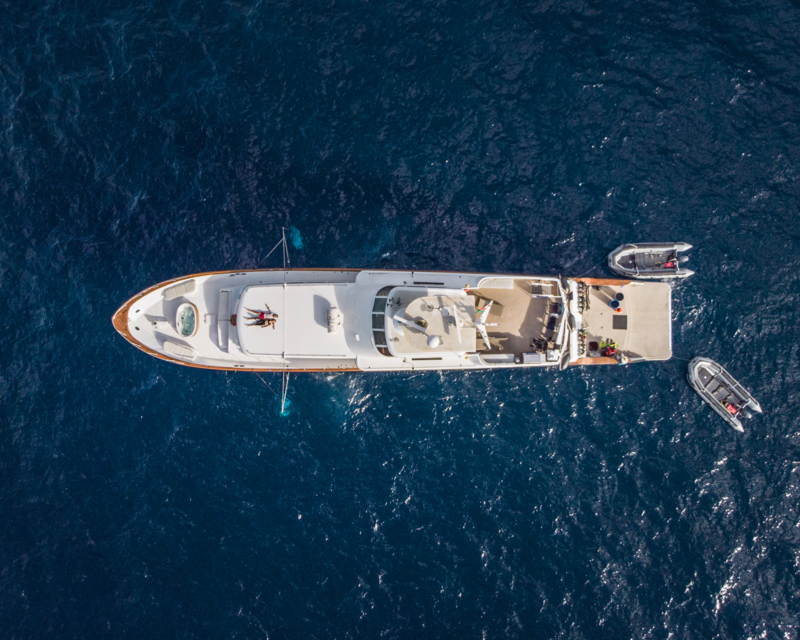 A dive that I will never forget – thank you to all the crew that made this possible! This experience cannot be equaled! Manta Manta Manta from start to end, then the dolphins crashed the party, wanting attention. The show from the dolphins was spectacular. The interaction between manta , diver and dolphin was so special and was one of a kind. At the safety stop, I looked up to see a booby peering through the surface to see what all the fuss was about. Thank you to the crew who make this possible. Undoubtedly one of the best dives of my life! For the entire dive I didn’t know where to look, left, right, above and below… everywhere you looked there were mantas and playful dolphins trying competing with each other to catch my attention! Absolutely stunning!! And seeing a pregnant female manta was another great high of this extraordinary dive! Was ein Erlebnis!!!! Besonders der erste Tauchgang morgens. Delphine und Mantas kaempften um unsere Aufmerksamkeit….. Ich wusste nicht wo ich zuerst schauen sollte. Von der ersten bis zur letzten Minute wurden wir von Mantas und Delphinen begleitet. Keiner wollte aus dem Wasser und diesen Moment beenden. Es war der beste Tauchgang meines Lebens und ich habe so einige hinter mir. 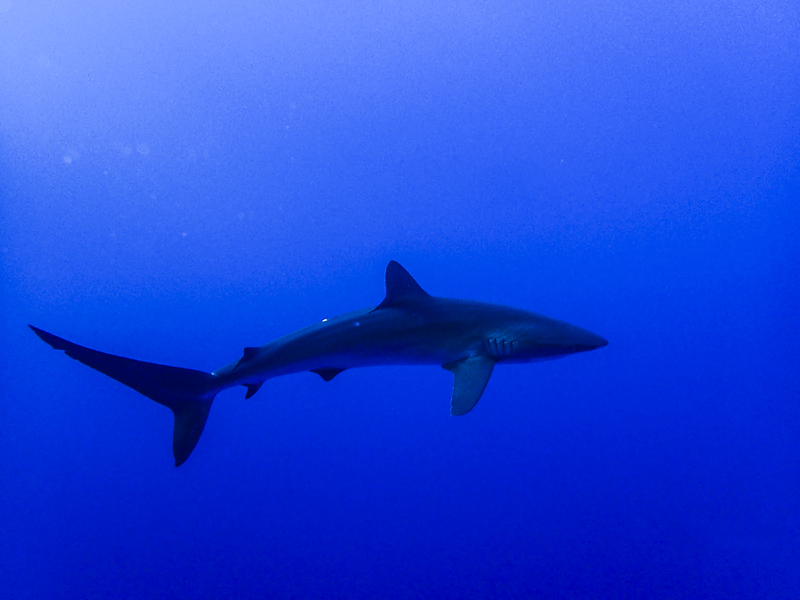 Unbelievable last days diving to complete another wonderful trip at the Revillagigedo Islands. First dive of the day spent with Mantas and dolphins and more Mantas on the other three dives. Hard to describe just how uplifting the experience was and I am certain will be talked about for many days and months to come. Thanks to the crew for a memorable trip and to the creatures of the sea for turning up and putting on a fantastic show. 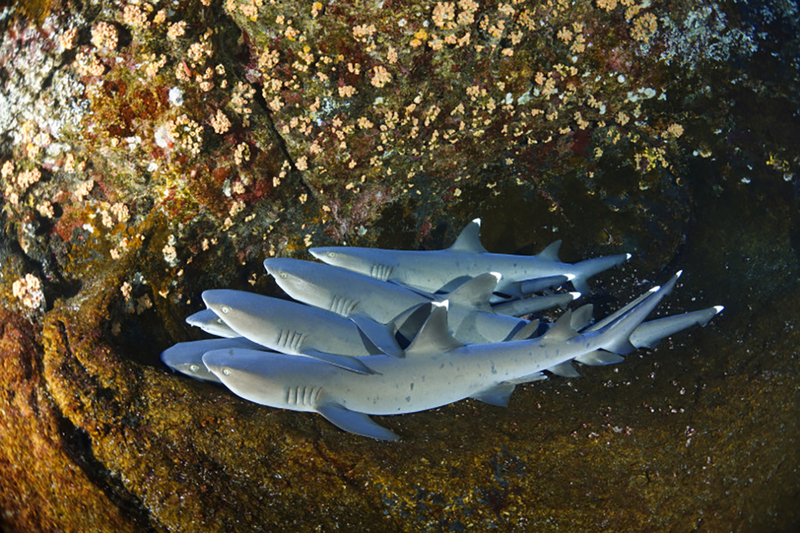 Sleepy baby sharks get cozy at Socorro. We are a group of dive instructors with our students from Taiwan. We do 2 to 3 dive trips every year. We liked the trip with Nautilus Explorer. We really liked the very close encounter with the dolphins and it was our first encounter with Giant Mantas. And we saw them much closer than the Reef Mantas that are common in South East Asia. They are so friendly. 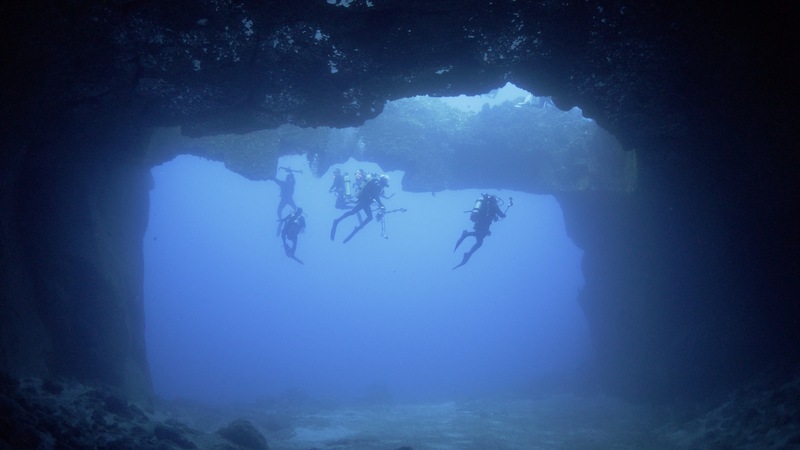 Our favourite dive site was Roca Partida. We really liked the rooms, especially the Emerald Suite. The dive deck is very spacious and the skiffs are confortable with a ladder. If we get another chance we would like to organize another trip with Nautilus!! –Ryan, Xanthe & the Taiwan Dive Team! I would like to thank all the crew on board. I had a comfortable, amazing trip, and felt welcomed by the friendly crew and people on trip with me. I was spoiled by the variety of healthy and delicious food. I never felt hungry. The service was excellent. We had four meals daily plus there was always different kinds of beverages and snacks waiting for us after every dive such as yummy cakes, nuts, fruit, hot chocolate, apple cider, or even beer and wine at night. Also hot showers, clean towels, and room service every day. It is a unique experience to see all the huge marine animals underwater like Mantas, hammerheads, and dolphins, plus a beautiful sunrise from the sea level and countless stars at night.